that you are reading this paper. There is so much wrong in this add, so much threat that the mind of anyone should reel at the implications. But let's start by the beginning before any one thinks that this blogger is prejudiced: there is indeed freedom of expression in Venezuela, although increasingly threatened and occasionally limited. What is lacking everyday more and more is freedom of expression. And this has been building up for quite a while, with increasing refusal of the state to talk to anyone but "official" media, and effective freedom of information done with when RCTV was closed last June. First, let's discuss the context of this add. This week end the IAPA/SIP organized its first of two yearly meetings, this one in Caracas. During last year referendum campaign the government tried to put all sorts of obstacles to the meeting been held anywhere in Venezuela. But the SIP said that they would come no matter what and that lodging would be found one way or the other (remember the latest round of governmental pressure over hotels when the Alejandro Sanz concert had to be canceled). So the SIP came and offered Chavez to open the meeting and expose to the SIP his point of view on the whole matter of freedom of expression in Venezuela and elsewhere. Chavez did not show up and did not even had the decency to refuse. No answer, period. However the government sponsored a "counter meeting" a couple of blocks away from the SIP hotel. It was called "encounter against media terrorism", no irony intended. As it is becoming more and more the case, the effect of this counter meeting was rather negative to the state as it flopped badly. In fact, it more than flopped, something stressed when Marcos Hernandez of Reporteros por la Verdad, was given a right of response at the SIP and showed his low class, his partiality and his incompetence, not to mention the compulsive lies now the everyday talk in chavistadom. He threatened Mr. Natera, director of Correo del Caroni, a much attacked newspaper, with judicial action by accusing him of being a coup monger in front of all the SIP. That Natera was the spokesperson of the Venezuelan press for that meeting exposed clearly to the whole world better than anything else how threatened is now freedom of expression in Venezuela. Of course, with his very tarnished image of Chavez was certainly not going to take a chair in a room where someone would dare to criticize him. If you look at the purges inside the all but still born PUSV, whomever might criticize Chavez, even behind closed doors, has been shut out of the chavista pseudo political party. These days Chavez has his paid agents to take the heat wherever needed. That the SIP did criticize much more than just Venezuela, the US was one of the targets, did not make a difference: Chavez wants to project an image of being above criticism even though everyday he is more deserving of it. The self righteousness of Chavez, and his thinning skin are everyday more obvious, as much as his bloated physique. however as he keeps insulting the SIP this one says that only Cuba has more limits to freedom of expression than Venezuela in the Americas. Now to the add published above. 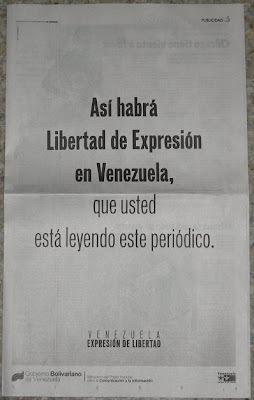 It is very simple: it is a direct threat to El Universal as this add implies directly that El Universal of Caracas, the Venezuelan senior paper, is published at the sufferance of the regime. Its objective might have been to criticize the SIP meeting but in fact it achieves (willingly perhaps?) the opposite effect. Did the subconscious of the public official in charge of this add betrayed him/her? "There is a President (Hugo Chávez) who is persistently attacking journalism and harassing and insulting the press. Journalism here is faced with serious restrictions, and when journalism is exercised under serious restrictions there is no press freedom,"